It's true theatre fans. Or should I say ABBA fans. Mamma Mia, the show that as of today has been seen by over fifty-four million people and grossed over two billion dollars at the box office will play it's final performance on Broadway on September 12. When it closes it will have played a total of 5,773 performances and will be the eighth longest running show in Broadway history. Not bad for a show that most Broadway insiders thought would never succeed. After all up until that point the only successful jukebox musical on Broadway was Smokey Joe's Café which ran for almost five years and was nominated for seven 1995 Tony Awards including Best Musical of the Year. It lost that year to Sunset Boulevard. Now here we are in 2015 and Mamma Mia is set to say goodbye to Broadway for good. Although based on it's popularity I'm sure this will not be the last time that the Great White Way will experience this feel good musical. When it was announced a few weeks ago that it was closing I went back and read a few reviews and articles about the show. I had forgotten that Mamma Mia opened shortly after 9/11 and if you recall the last thing people wanted to do was hop on a plane to come to New York City. However as it turns out Mamma Mia was just what not only Broadway needed but what we all needed. A way to escape if only for a little while. Who knew a little show with a bunch of songs from the seventies could do all that? 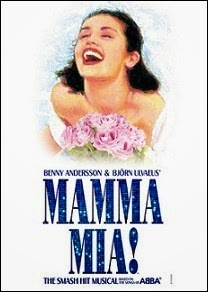 For that Mamma Mia we thank you. Now for those of you who still haven't seen the show or for those of you fans who want to see it again you have come to the right place. We sell it. Not only that but if you order right now you can tickets to see Mamma Mia at prices that are lower than ever. Be advised that while this "Special Offer" is good thru September 5 it is for select seats and as always subject to availability. Get your Mamma Mia tickets on Broadway at the Broadhurst Theatre. It will have you dancing in the aisles.